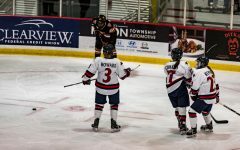 COLORADO SPRINGS, Co. — The Robert Morris University men’s hockey team (9-14-1, AHA 8-9-1) has been put through a number of trials and tribulations throughout the 2018-19 season such as taking on nationally ranked Bowling Green to start the season, playing the number one team in the country, St. Cloud State in the Three Rivers Classic, and starting off the second half of the season going 2-6. Another trial presents itself this weekend when the Colonials travel to Colorado Springs, Co. to play Air Force, (11-9-4, 9-6-3 AHA) in a rematch of last year’s conference final where the Falcons defeated RMU 5-1. 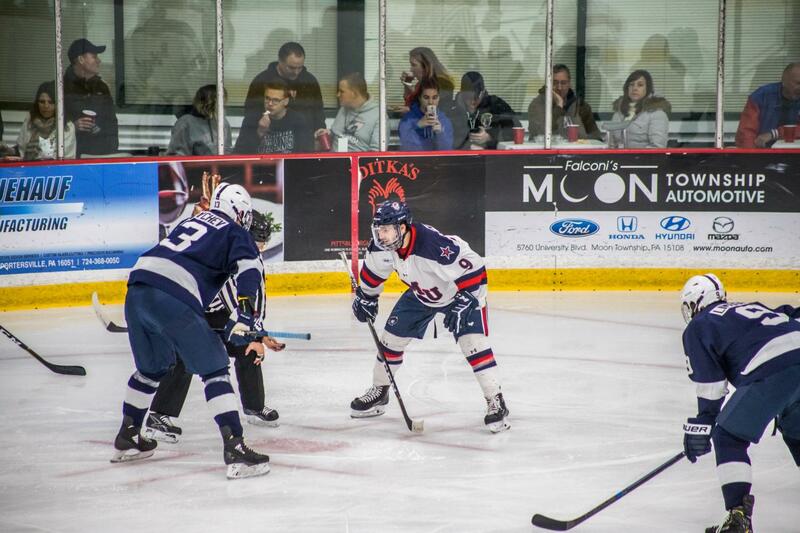 The Colonials are looking to have a different outcome to their two games this weekend. Air Force has spent most of the year at the top of the AHA standings but isn’t nationally ranked as of now. Air Force is receiving votes, but not enough to crack the list. Their streaky season is most likely why the team has not made the rankings. The Falcons opened their season 1-4 before winning five straight to reclaim their reign over the AHA. Air Force has yet to have an alternating result since the third game of the season. Since then, they haven’t won a game and immediately followed it up with a loss. The only problem with that is, they haven’t been winning lately. In their last five, the Falcons are 0-2-3 after two consecutive ties against Army and a tie against Sacred Heart. Air Force has been struggling offensively recently, but that doesn’t mean they’re incapable of scoring. The Falcons have their weapons and plan to use them accordingly. 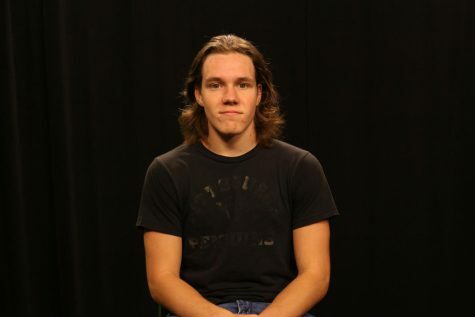 One player, in particular, is senior forward, Evan Feno. Feno co-leads the team with nine goals and eight assists for 17 points. Feno hasn’t been a consistent scorer, but more of a guy who buys his points in bulk. Feno has only scored in a third of his team’s games but is tied for the team lead in points. The sole reason for him being a player to watch is he hasn’t scored in five games and is due for a big payday on the score sheet. Another Falcon to keep an eye on is senior defenseman, Matt Koch. Koch also has 17 points this year but his totals are more assist based than Feno’s. You shouldn’t expect Koch to score as his shooting percentage is 5.9%. Koch is a distribution and passing defensemen rather than an offensive shot machine. If Air Force scores, Koch is going to have some part in it due to him scoring in over 50% of Air Force’s games. The Colonials have a chance to get on top of a struggling Air Force team early and to do that they’re going to need some early offensive firepower. Luckily, the Colonials have Alex Tonge. Tonge leads the team in points with 19, but that’s not solely his reasoning for being mentioned, it’s the leadership role he possesses that is important this weekend. 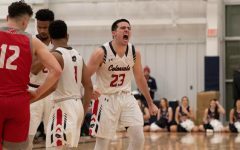 If Tonge can break through early then the young team around him may rally and the Colonials could possibly bury Air Force before they even know what’s happening. To keep Air Force at bay the Colonials will need a defensive edge to their game as well. Francis Marotte can give them the edge that they need. Marotte has been steady all year and has shown no signs of playing any different. A large part of the Colonials having a chance to win every night is credited to Marotte. 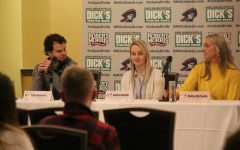 Robert Morris has had a tendency at times to have a slow start to their game and Marotte is quick to answer the bell and keep his team alive when they need to rely on him. 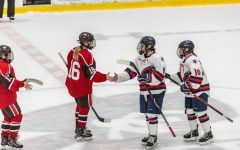 Robert Morris could walk away with two wins over a top three conference opponent this weekend if they see the Air Force team that’s been showing up for the last five games, but Robert Morris could also walk away with two ties if they see the Air Force team that’s been showing up for the past five games. The key word here is could, because this conference is so competitive anything could happen. Air Force hasn’t been winning games, but a majority of their last five have ended tied. Ties are no fun so let’s try to avoid that altogether. Robert Morris hasn’t been spectacular but is coming off a win then lose situation in Canisius. Neither team is happy with their previous result and is looking to get back in the win column as soon as possible. These games will be fast, staunch hockey that doesn’t have any breaks. Whoever makes the most out of what they’re given will come out on top. Needless to say, we’re looking at a tie on the first night and a one-goal game on the second night.